A GAL NEEDS...: To Your Health! GT's Synergy Kombucha Drink! To Your Health! GT's Synergy Kombucha Drink! I recently stumbled upon an article about Kombucha, the wonder tonic that is being touted as the year's hottest cool beverage! Apparently, it has replaced the craze for Acai and Pomegranate juice and has the likes of Reese Witherspoon carrying it around on New York City streets. The recorded history of Kombucha begins in 19th Century Russia, but is thought to date back to early China, during the Qin Dynasty (221-206 BC). It was called 'The Drink of Immortaility', and today still has many health claims, the main one being that it detoxifies the body and energizes the mind'. There are many Kombucha enthusiasts, who swear by the beneficial results Kombucha consumption brings! A recent study suggests that glucaric acid, the active ingredient in Kombucha, probably makes the liver more efficient. Also, Glucaric acid is commonly found in fruits and vegetables, and is being explored independently as a cancer preventive agent. Enter G.T. Dave and Synergy drinks--In 1995, Millennium Products founder GT Dave's life came crashing down when he heard that his mother, Laraine Dave had just been diagnosed with a highly aggressive form of breast cancer. After a week of emotional turmoil, he was relieved to find out that her breast cancer had not spread and that the pungent tasting cultured tea that she had been drinking was part of the reason why. Active Enzymes - These are the "life force" of the most vital raw foods. Research shows that every human is born with a plentiful amount of enzymes. However, they bigin to diminish as we get older which results in signs of agin. When these enzymes are replenished the body is able to maintain a more youthful state. They also assist in the stomach's metabolism of foods, soothe indigestion and calm the appetite to prevent overeating. Mucointinsulfat Acid - Repairs the stomach lining. My first experience with Synergy Kombucha was funny because I wasn't expecting what I tasted. 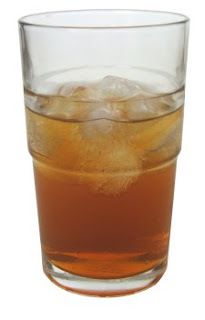 This is a sweetened tea, that’s been fermented by a symbiotic colony of bacteria and yeast (a SCOBY, a.k.a. “mother” because of its ability to reproduce, or “mushroom” because of its appearance). I was expecting a sort of fruity taste because I got the 'Cosmic Cranberry' for my first bottle. Instead, I got a tart, vinegary, fermented, trace of alchohol, sort of taste and I really didn't like it that much. But I forged ahead and got through the bottle. The next flavor I tried was the Strawberry Serenity. This was much easier to drink and by then I had figured out that this isn't a drink that you chug down. It's something you sip throughout the day, maybe before a workout, or before a meal to control appetite. There is no wrong time to drink Synergy Kombusha. So the way I like to drink it is throughout the day. I did have immediate results or signs of improvement. I felt more energetic and had more clarity of thought. I felt better digestive processes and I felt more able to wake up in the morning. Is it because of Kombucha? I'm not sure. Apparently, there are over 3 million people who regularly drink Kombucha, according to a report on NBC's Dateline. They must see something beneficial about it. So, may I recommend Synergy's Organic & Raw Kombucha to you? Other flavors include Mystic Mango and Divine Grape, among others! It's definitely worth a try! Get it at your local health food store or where quality health products are sold! I'd love to know if you've tried Kombucha and what you thought about it. Please leave me a comment here. If you haven't tried it, does it sound interesting, or just another health fad, here today, gone tomorrow? Never heard of it, but would like to try it! Great blog!! I just came upon it and have become a new follower. Visit me at Mama's Little Chick. Following from FF please follow back. Love the blog! Happy Friday!